Failure of the financial system, with massive money printing and currency debasement. Gold will follow inflation, which will increase strongly, eventually leading to hyperinflation. Real interest rates will be negative, which favours gold. China’s accumulation of gold on a massive scale, and the introduction of a gold-for-oil payment system. Western central banks have leased/sold some of their gold, which is now in China and will never return. 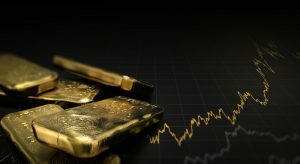 The paper gold market will collapse and gold will go ‘no offer,’ meaning it can’t be bought at any price. Inflation will increase institutional gold buying substantially. Gold is 0.4% of global financial assets today. An increase to 1% or 1.5% would make the gold price go up multiple times. Today, relatively low global demand means that annual gold production of 3,000 tonnes is easily absorbed. With falling production, the coming upturn in demand can only be met by higher prices. Von Greyerz also discusses stock markets with no fear; interest rates increasing; inflation rising; the US dollar’s accelerating downtrend; the stock market bubble bursting; and gold’s accelerating long-term trend.